Offenburg, January 12, 2012 - HOBART has heralded improvements in every area while reducing consumption in the company's new 2012 generation of PROFI FTN flight-type and PROFI CN rack-type dishwashers. The Offenburgbased warewashing manufacturer's new PROFI generation of appliances gives you compelling performance across the board from features to usability – with cost savings to boot. PROFI Generation 2012 models are significantly lower on water, detergent and energy consumption thanks to innovative technologies in washing processes, cutting operating costs by a further 15% compared to previous models depending on load. Equipped with the patented energy-management system EFFICIENT as standard and optional exhaust heat recovery, the new PROFI Generation 2012 models run on up to 10% less power. This substantial reduction in water supply requirement gives you a significant reduction in detergent, while the wash system CONTACTPLUS and the triple rinse TRI ensure a perfect wash result. The optional cleaning system PERMANENT CLEAN increases wash water quality by actively removing large dirt particles from the pre-wash zone, thus avoiding frequent water changes and reducing detergent consumption. HOBART has made noticeable improvements to drying performance in Generation 2012 – the patented dryer GUIDEAIR funnels the air via channels and nozzles directly above and below the ware for faster drying. The dryer GUIDEAIR guarantees perfect drying results for hollow items such as cups, bowls and glasses. Usability has seen a major increase with the new electronic control SMARTRONIC. Apart from switching the appliance on and off, SMARTRONIC automatically controls all of the other functions in the appliance. In addition, cleaning the appliances is quick and easy – the new cleaning aid makes manual cleaning easier by continuously cleaning the nozzles from the inside during operation to prevent soiling deposits. HOBART provides an optional filter-monitoring system to increase process reliability; the monitoring system raises an alarm if soil filters are absent or have been improperly fitted in the pre-wash and wash zones. The flight-type dishwasher PROFI FTN is available with optional conveyor belt FREEFLOW that makes sure spray reaches every part of your washware – even in varied washware loads. 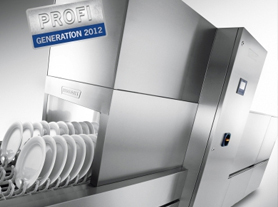 More performance and usability, lower consumption, and optimisation in every area – the world's largest industrial warewashing equipment manufacturer's new PROFI generation provides efficient, economical and reliable solutions for hotels, restaurants and cafés, and community kitchens.